INFINITI and Renault Sport Formula One™ are pushing the potential of F1™ technologies. Together, we’re embarking on Project Black S, an exploration of the first road-ready F1™ inspired car. In 2016, INFINITI made the move to become technical partners with Renault Sport Formula One™. Harnessing our expertise in hybrid advancements and combining engineering efforts, together we co-developed the Energy Recovery System, one of the most sophisticated technologies in motorsport. We never stop pushing performance. By harvesting both kinetic and heat energy, the Energy Recovery System powers the Renault Sport F1™ racecars on the track. Project Black S is the opportunity to explore the potential of bringing this technology to the Q60 Coupe. Delivering greater power, torque and immediate acceleration on the road. With the Q60 at the heart of our venture, we begin to reimagine the future of performance on the road. Our vision for Project Black S begins with a high-performance aesthetic. A large fixed rear wing channels the wind to propel Q60 assertively forward. Made of carbon fiber, it maximizes speed and aero-efficiency so the vehicle hugs the road at every turn. Always going against convention, INFINITI is driven to pioneer new ways of enhancing your performance. Project Black S explores F1™ technologies, in an effort to provide maximum power for potential road vehicles. 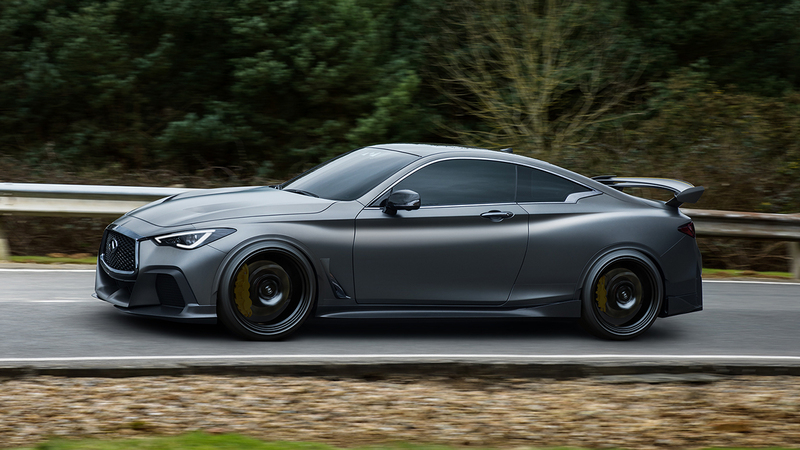 Project Black S takes Q60’s uninhibited design and performance to the next level. Flared wheel arches and enlarged air intakes enhance aerodynamics, with an enviable – even aggressive – look.